On Monday, 13 August 2018 at 10h00 the Constitutional Court handed down judgment in this matter, in which it confirmed two declarations of constitutional invalidity by the High Court of South Africa, Gauteng Division, Pretoria (High Court). The High Court declared constitutionally invalid then President Jacob Zuma’s conduct in the termination of Mr Mxolisi Nxasana’s appointment as National Director of Public Prosecutions (NDPP) and the subsequent appointment of Advocate Shaun Abrahams to the position. The High Court further declared section 12(4) and (6) of the National Prosecuting Authority Act 32 of 1998 (NPA Act) constitutionally invalid. These subsections respectively allow for the extension of the NDPP’ s term of office and indefinite suspension of the NDPP and Deputy NDPP without pay by the President. The President appointed Mr Nxasana as the NDPP from 1 October 2013. Following internal conflict within the senior leadership of the National Prosecuting Authority (NPA), in June 2014 the President took a decision to institute a commission of inquiry into Mr Nxasana’s fitness to hold office and to suspend him pending its outcome. The proposed suspension never took effect as that issue was settled after Mr Nxasana launched an urgent application in the High Court for an interdict. Before the commission of inquiry could commence with its task, Mr Nxasana concluded a settlement agreement with the President and Minister of Justice and Correctional Services. Pursuant to this, Mr Nxasana vacated his position as NDPP in May 2015 in exchange for a settlement payment of R17.3 million. Subsequently, former President Zuma appointed Advocate Abrahams in his place. The High Court heard the applications simultaneously. It refused to condone the late filing of Mr Nxasana’s affidavit. On the merits, it held that the settlement agreement between the President, the Minister of Justice and Correctional Services and Mr Nxasana and the decision to pay Mr Nxasana an amount of R17.3 million were invalid and that the resultant vacation of the office of NDPP by Mr Nxasana was inconsistent with section 12(8) and (9) of the NPA Act and thus invalid. It accordingly set aside the settlement agreement and Mr Nxasana’s vacation of office. It also declared the appointment of Advocate Abrahams invalid and set it aside. Mr Nxasana was ordered to pay back the R17.3 million. The High Court ordered the then Deputy President to appoint a new NDPP within 60 days of the order. It also declared section 12(4) and (6) constitutionally invalid. The applicants approached the Constitutional Court for confirmation of the declarations of invalidity. Mr Nxasana cross-appealed against the High Court’s refusal to grant him condonation for the late filing of his explanatory affidavit and the costs order granted against him. The NPA and Advocate Abrahams cross-appealed against the declaration that the appointment of Advocate Abrahams was invalid. In a majority judgment written by Madlanga J, in which Cachalia AJ, Dlodlo AJ, Froneman J, Goliath AJ, Khampepe J and Theron J concur, the Constitutional Court declared the settlement agreement, the obligation to pay the sum of R17.3 million and Mr Nxasana’s vacation of office constitutionally invalid for being inconsistent with the constitutionally required independence of the office of NDPP. While not deciding the question of whether the NDPP may vacate office outside of section 12(8) (which regulates an NDPP’s departure from office), the Constitutional Court held that no NDPP will be entitled to benefits that exceed those to which they would ordinarily be entitled under section 12(8). The majority further held that since Mr Nxasana’s vacation of office was invalid, it follows that the appointment of Advocate Abrahams was also constitutionally invalid. The majority thus dismissed the appeal by Advocate Abrahams and the NPA. On the validity of section 12(4) and 12(6), the majority held that this section undermined the independence of the office of NDPP and confirmed the High Court’s declaration of invalidity. The majority also held that the High Court misdirected itself on the facts when it denied Mr Nxasana condonation for the late filing of his explanatory affidavit and that the Constitutional Court was therefore entitled to interfere in its exercise of discretion and grant him condonation and accept his explanatory affidavit. The majority then proceeded to consider whether it was just and equitable to allow Mr Nxasana to resume office as NDPP. It held that the resumption of office by Mr Nxasana would not be just and equitable as it would not vindicate the rule of law. The majority reasoned that the conduct of Mr Nxasana in his willingness to vacate office if he was paid the right “price” is not conduct that befits an NDPP. On whether it would be just and equitable for Advocate Abrahams to remain in office, the majority held that he was a beneficiary of the improper conduct of former President Zuma and that it would not be proper to allow him to continue in office. With the exception of granting the appeal by Mr Nxasana on the admission of his affidavit and the costs order against him, the majority upheld all the orders made by the High Court and confirmed all the declarations of invalidity made by that Court. In a minority judgment by Jafta J, in which Petse AJ concurs, Jafta J held that if it is accepted that the termination of Mr Nxasana’s appointment and the settlement agreement were unlawful, the consequence of setting them aside is an automatic restoration of the status quo ante (the default position). That entails the return of Mr Nxasana to office. Jafta J further elaborated that in this matter there is nothing exceptional or extraordinary that warrants the exercise of the Court’s remedial power to prevent Mr Nxasana from returning to office. The minority reasoned that Mr Nxasana’s return would certainly not cause a constitutional crisis or a national crisis. On the contrary, his return would enable the President to lawfully remove him from office and Parliament would play a vital part in that process. More importantly, preventing Mr Nxasana from returning to office without pronouncing on the validity of his employment contract would not only be unfair to him but would also create considerable uncertainty on the parties’ rights and interests. Allowing Mr Nxasana to return to office does not mean that he is fit to continue as NDPP. If his involvement in the conclusion of the settlement agreement makes him unfit to hold office, it would be open to the President to invoke section 12(6) and establish an inquiry to determine his fitness, with Parliament’s involvement contingent on the outcome. Jafta J concluded that to require Mr Nxasana to pay back the money in circumstances where he is not allowed to go back to office cannot be fair to him. On the other hand, allowing him to go back to his job would meet the objects of the Constitution and the rule of law. 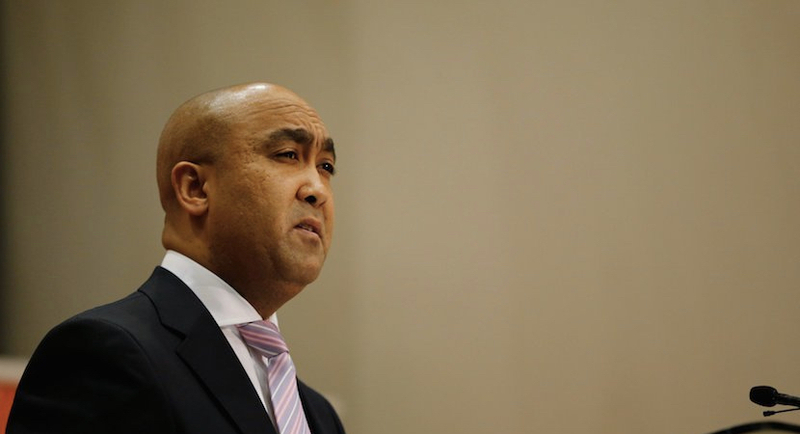 (Bloomberg) – South Africa’s top court ruled that the appointment of the nation’s chief prosecutor, Shaun Abrahams, was invalid because his predecessor was unlawfully removed from office, and ordered President Cyril Ramaphosa to appoint a replacement within 90 days. The ruling is a boost for Ramaphosa, who has pledged to stamp out graft since he took office in February, when the ruling party forced Jacob Zuma to step down after a scandal-marred tenure. Abrahams had been accused by opposition parties and rights groups of delaying decisions to prosecute Zuma and his allies who’d been accused of graft. Mxolisi Nxasana was paid the “obscenely huge amount” of R17.3 million ($1.9 million) to step down as head of the National Prosecuting Authority and there was an inference that Zuma had sought to buy him out of office, Constitutional Court Judge Mbuyiseli Madlanga said in a ruling in Johannesburg on Monday. The appointment of Abrahams as head of the NPA in place of Nxasana was therefore constitutionally invalid, the judge said, upholding a similar ruling by the High Court. The court ordered Nxasana to repay money he received as a settlement because he’d agreed to vacate his office in May 2015, and said his reappointment as chief prosecutor couldn’t be justified and wouldn’t restore stability at the NPA. The application to overturn Abrahams’ appointment was brought by civil-rights groups Freedom Under Law and Corruption Watch. Abrahams has said he always complied with the law.